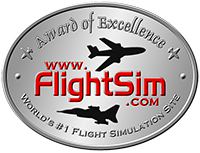 The FSX, FSX:Steam and Prepar3D Add-on "Douglas DC-8" has been honored by FlightSim.com with the Award of Excellence. "If you're into the early days of jetliners and want an aircraft which faithfully models the systems of the time, then this is definitely an aircraft worth exploring. Likewise, if you're a modern heavy metal flyer who's thinking about delving into something a little older, then here too, the DC-8 becomes highly attractive. Flying the Aerosoft DC-8 has been an absolute joy, and is an aircraft I highly recommend flying!" The review link can be found on the product page!